It was our pleasure to work on this web design project for musician Kenney Jones, the renowned drummer of The Small Faces, Faces, The Who and The Law, and latterly the Jones Gang. 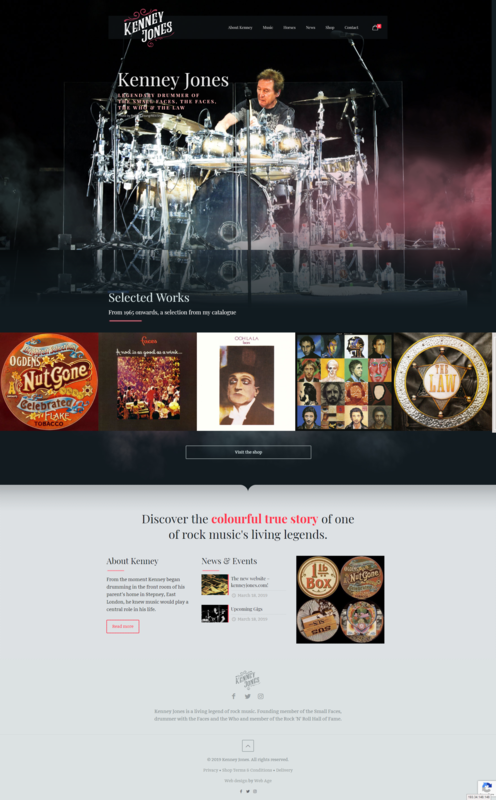 We worked closely with Kenney’s family to bring the story of one of the living legends of rock music together on a smart, cost-effective responsive website. With a rich selection of content reflecting on his life, his drums, career with these famous bands and his personal love of horses, we assembled this wealth of text and photos into what we hope is a an attractive and engaging design. It’s certainly received some really positive feedback from Kenney’s fans on social media. One important concept that was essential to include was a simple but stylish timeline illustrating Kenney’s career in chronological order. We used WooCommerce to create a simple store that website administrators can easily learn and develop a merchandise store over time. We designed a new logo for Kenney with one eye on the past, taking a hint of inspiration from the classic logo style of the Small Faces’ Ogdens Nut Gone Flake artwork, but keeping it contemporary with some current retro/vintage font and ornament choices. The result was what we hope is a engaging design that works well on mobile and desktop alike, with pleasing layouts and well-structured content plus lots of exclusive and historic photos organised neatly in extensive photo galleries. Our clients were delighted with the result and, as mentioned above, the response on social media has also been extremely positive with fans congratulating Kenney on the new website. This is a project that we are quite proud of and if it’s something that inspires you, get in touch with us today to discuss your requirements and we’ll be happy to help design something similar for you.